Get Real Instagram Followers Free! The ULTIMATE GUIDE to Becoming an Influencer on Instagram! Are you trying to grow your instagram following but you’ve reached your plateau? Don’t buy follower bots! Get REAL instagram followers free the right way and learn how to MONETIZE your instagram. Before I knew how to grow my instagram following organically, I was pretty much stuck around the 500 follower mark. As of February 2019, I’m sitting at 26k. Let me show you how to get free instagram followers instantly, and how to turn that following into consistent monthly revenue. Have a Blog? Learn how to monetize it then connect it to Instagram! Instagram 101: It’s all about photos, right? Second, I want to show you what my post engagement used to look like before I took the steps to grow my instagram following. Here’s a post from when I was around the 300 – 400 follower mark. Does this look pretty familiar? One of the most awesome experiences I've ever been a part of. Drifting across the sky at sunrise watching the city below you come to life. Thank you @globalballooningaustralia for the experience of a lifetime! You have what you feel is an awesome photo, but instead of it breaking instagram and going viral, it’s sitting right around the 40-50 like mark with a handful of comments. It’s not that you’re doing anything wrong. You’re not. There’s just a few small things to tweak to explode your following. That’s me in Dubai in November 2018. I love that picture. Our guide for that sunrise camel ride excursion is apparently a genius photographer. With over 7,000 likes, that shot is currently my most liked photo on the Gram. (Cool people call it the Gram, by the way). It’s not my most commented photo. I have a few nearing 100 comments. But what a difference in engagement from the example before, right? That shot is from a few months back so it’s had time to grow all those likes. My more recent shots average anywhere from 1800-2400 likes within a week. Turning your Instagram profile into a Business Profile allows you access to your insights & analytics as shown above. This is huge for maximizing your success with engagement. More on this in a bit in the Perfect Instagram Profile section! Do you want that kind of engagement? I’m going to show you the exact steps I took to grow a very engaged following organically so you can get instagram followers free and see your posts get all the eyes on them they deserve. Not to mention perks like these! As with everything online, a large following means influence, and influence means potential for revenue. When I say that a large following means influence, it’s because, whether you like it or not, that’s exactly what you’re doing when a large number of people are following you. You have a large, engaged audience who has similar interests to you. So guess what? If you tell them how awesome that neck pillow is that you just bought, they may just buy one for themselves for their next trip. Affiliate marketing is the very lucrative industry of connecting people with similar interests to stuff they’ll like. Influencers play a huge role in how most internet business is done. This means that when you grow your instagram following ORGANICALLY with REAL PEOPLE following you, there is potential to MONETIZE your Instagram as an influencer. However, if you go and buy a bunch of fake follower bots, then what influence do you have? You’ll have a huge, empty following which won’t engage at all. There’s no revenue potential in that. Don’t buy follower bots! Get Started Free with the Affiliate Marketing Training Community I Call Home! At its very core Instagram is a social media platform all about photos. It would make sense then to know a little bit about taking photos, right? Remember, you’re trying to attract a large audience, so the easiest way to do that at a glance is to have a gallery of good shots. I took this shot at La Sagrada Familia Cathedral in Barcelona in January 2018. The lines in this shot make me happy on the inside. Some random dude struck the perfect pose, looking up at the perfect angle, I had my phone in hand, and I got completely lucky. See, you don’t need fancy gear to take good photos. Your phone will do just fine. In fact, I prefer mobile photos because, as they say, the best camera is the one you have on you, right? And my phone is ALWAYS on me. Also, to be a good instagram photographer with a large following you don’t need to take any expensive photography class. If you love taking photos and want to expand your knowledge of photography, by all means go for it. But I would say if you want to get a good grasp on a basic rule of photography to take better shots, let that rule be the rule of thirds. Here’s a really quick video on the rule of thirds. Simple enough, right? I have a ton of digital editing apps in my phone. What I love about digital photography is that you can take an ordinary photo and transform it into something new with just a few swipes. Now don’t worry. Instagram has several sweet filters built into it. This means you can tweak all your photos without getting too crazy running photos in and out of editing apps it. BUT if you want to take that next step, there are some great options to look at here. With digital photography it’s like having a canvas in front of you and every swipe of your finger can add light, shadow, texture, and so much more to create something completely original. For someone like me who loves digital photography, this is the fun part of taking pictures. Perfect! So now that you know how to take a decent instagram photo, and you have some handy photo editing apps in your tool belt, let’s dive into how to EXPLODE your instagram following. When using Instagram, engagement is all about 3 things: liking, commenting, & following. This is the insta-trifecta that can take you all the way to that coveted blue checkmark by your name. Think about what happens when someone likes your photo. You might get a notification. Cool. Now what about when someone comments on your photo? Oh wow, they really like this shot. Maybe you leave a reply back. (Always reply back). And when you get a new follower? Success! They like you! They really, really like you! Now think a little more about when someone likes AND comments on your photo. In addition to replying you might just click on their username and check them out. “Oh did they say we have very similar feeds?” You’re definitely taking a glance then. Now think about what happens when someone does all 3. They like, comment AND follow you. Every single one of us will click on their username and check out their feed. If you like what you see, you follow back. This is why it’s so important to have a quality (and RELEVANT) feed so that when that user you liked, commented, and followed takes a glance at your profile you are THAT MUCH MORE LIKELY to gain a follower. This takes us to the next point, knowing which accounts to like and follow for MAXIMIZE your growth. This is a big one. Think about who you want following you. Do you want a bunch of quiet observers or do you want a crowd of HYPER ENGAGED individuals who are almost what you’d call “power users” to make up your following? (Everyone wants the latter). So where do we find them? The first accounts to target are the “mega influencers” in your niche. These are accounts with a very large following well over 100k. Let’s use my niche of travel for example. There are so many huge accounts in this space and that makes this even easier. You want to go after those accounts who have huge followings and get massive engagement. These are examples of accounts in the travel niche who have hundreds of thousands of followers each. Not only that, but when you take a look at their ENGAGEMENT, they have THOUSANDS of likes and comments for each photo they post. Not only do you want to follow, like, and comment on the content of these influencer accounts, but you also want to follow, like, and comment on the FOLLOWERS, LIKERS, AND COMMENTERS of those influencer accounts. When you go to the most recent posts from these influencer accounts, you’re seeing your target audience right in front of you. The likes and comments you see in these posts are from people you want commenting on your stuff too, no? They have an interest in your niche, and even more importantly, they are ACTIVE instagrammers who actively comment on posts they enjoy. So Which Followers Do I Target to Get a Return Follow? See, when you comment and like the posts from the mega influencers, it’s rare that they follow you back. They’re getting likes and comments all day long. That’s ok though, because your purpose isn’t really to get the whale to notice and follow you. It’s their active followers who will take notice. Every time you put yourself out there, especially with a comment, you’re creating an opportunity for one of their FOLLOWERS to take notice & click on your name and see what you got. The ones who notice the most are the ones with under under 500 followers themselves. Is their photo gallery similar to the content you’re putting out? Are they active? Have they posted a picture in the last 2-3 days? Do you like their content? Do they have under 500 followers? Have they published an instagram story in the last 24 hours? Do they have at least 25 posts? Does their profile mention an interest in your niche? When you find accounts that are matching these criteria, these are the ones you want to like and follow. And it’s ok if they don’t match EXACTLY. These are simply criteria to use to find active users. If you like the content of someone with say 900 followers, don’t hesitate to like, comment, and follow them too. Most of the time a follow alone can trigger the user to check out your account, especially when they have a somewhat low follower count themselves. But in my experience, a well worded comment can really tip the scales in your favor. And it’s easier than you think. Do you think that kind of comment will make anyone jump out of their seat and start a conversation? Nope. With each comment you leave you want to trigger emotion from those who read it. Not only is the user going to read it, but his or her followers will as well. You know how people will ask open ended questions when they want to start a conversation? It’s because it pushes the other person out of a one word response. Similarly, the type of comment we leave can trigger that person to check out our stuff. We’re not trying to necessarily start a conversation. We just want to pop up on their radar. So what kind of comments work the best? Comments that pay attention to detail and ask a question. Everyone likes someone who pays attention. Complimentary comments that have humor. Smiles spark interest instantly. Comments that reference your gallery. A well placed, subtle hint works wonders. Using just a little bit of originality and humor goes a long way. Leaving comments like these immediately spark interest. Couple that with the fact that you’ve taken the time to like their post AND followed them and you have a user that 99% of the time will click to your profile to check out your gallery. Now, let’s work on what they’re going to be greeted with when they get there. With Instagram you have a relatively limited area at the top of your profile to introduce yourself. It’s important, then, to take full advantage of this space to get the most out of it. Designate it is a “business profile”. This gives you access to insights & analytics. Include your real name & contact info. As you grow your following merchants looking for influencers will use this to contact you. Use a notes app to write it and create line by line spacing instead of one large paragraph. IMPORTANT: Utilize your ONE AND ONLY LINK that instagram gives you to LINK BACK TO YOUR OWN INTERNET REAL ESTATE! (i.e., your personal blog or website). This is a quick and easy step that unlocks so much data and insight that it really makes no sense not to do it. From your settings, simply click the “Switch to Business Profile”. It’s free and easy. You’ll need to create a Facebook Business page that will link to your Instagram business profile. Don’t worry, you don’t need to create any content or even be active on this Facebook business page if you don’t want to be. It just needs to exist. Switching to a business profile also allows contact buttons to be added to your profile to “Call” or “Email”, but most people’s eyes tend to move right over those. Personally, I like to include my email right there front and center on my profile. I started getting contacted by merchants looking for brand ambassadors as early as the 1000 follower mark. When you’re building influence, merchants notice and you’ll want them to be able to contact you as easily as possible. Use a “domain email” (ex: eric@workfromyourlaptop.com) to add professionalism and cause more merchants to take notice and take your influence seriously. To do this you’ll need your own website. More on that in the “Link to Your Own Website!” subsection ahead. When editing your profile information from within the Instagram app, you’re not allowed to create line by line spacing. Line by line spacing makes it much easier to read your profile information and pick out the important points, such as your contact info. To create better spacing, simply use your notes app to properly space it out, then copy and paste. Important! : Link to Your Own Website With the One & Only Link Instagram Gives you! Links in Instagram are a precious commodity. You only get the opportunity to use one single link on your profile. And until you get to the 10k mark with followers, you’re not able to share links in your instagram stories and have your followers “swipe up” to see more. For this reason, you want to have your own “internet real estate” to link to with the precious link you have. Having your own website is huge in terms of turning influence into revenue. There are almost limitless ways to monetize your own website and the traffic it builds. Use your one Instagram link as a portal to bring your followers into a space that is yours where you can further expand on all the great things you’re sharing through Instagram. Traffic plus influence equals revenue. If you’re a blogger already, then this is a no brainer. Use that one link you have to drive traffic to your blog. The massive following you’re going to create will transition beautifully to steady traffic to your blog. With traffic and influence going in BOTH DIRECTIONS between your Instagram profile & your website you now have the blueprint for consistent monthly revenue. Don’t know where to start? Don’t worry. I didn’t either. That’s why I recommend creating a free starter account with a training community called Wealthy Affiliate. There training is straightforward and delivers. Because of Wealthy Affiliate I was able to build a website that earned a $4k month in year one and a $7200 month in year two. 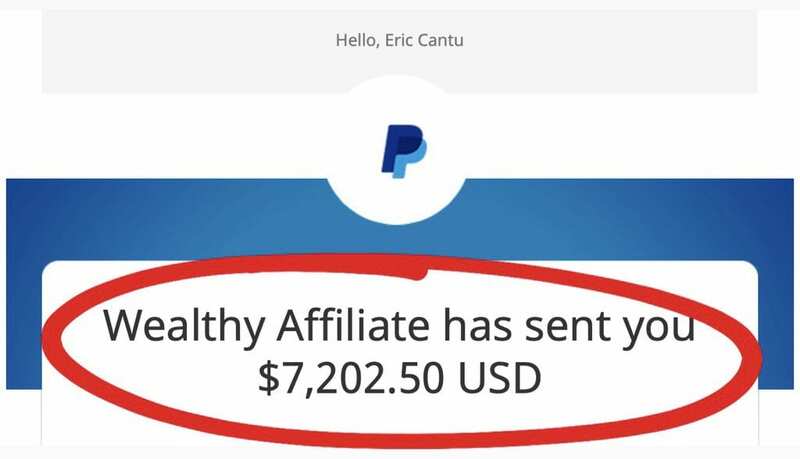 Learn how to make money on Wealthy Affiliate by reading my full Wealthy Affiliate review here. Try it for yourself free, then if you like what you’re learning, upgrade to yearly premium for less than $1/day. The best Instagram influencers tell stories through their pictures. They bring you inside each photo and tell you a story that fills in all the blanks. Take a second and scroll up to the two Instagram posts I shared at the beginning of this article. Notice in the first one that didn’t get much engagement that my caption was short. It doesn’t tell a story. It’s just a basic caption. However in the second post with all the engagement notice how that caption is much more detailed. It’s telling a story and starting a conversation. Treat every caption as a mini blog post. Good practice with captions includes asking questions, using emojis, and telling the story that led to the picture. Just How Much Do Your Captions Affect Engagement? I recently found out just how important captions are to your engagement. As I mentioned, I normally treat every caption as a mini blog post to try and bring the follower right into the story behind the picture. While the photo still got its share of likes, out of 30k+ followers do you want to guess at how many engaged with the post in terms of leaving a caption in the comments? ZERO. Further, a buddy of mine shared with me how he noticed that my newly published post was practically lost in his feed, hanging out with other posts that were 4 hours old. This is eye opening. It shows just how much importance Instagram’s algorithms place on captions. If you’re someone who is looking to gain influence through Instagram & turn that influence into conversions and consistent revenue, this is an important lesson to learn. Instagram uses hashtags to help categorize photos and make them easy to search. You’re allowed up to 30 in each post. By choosing relevant ones that have relatively low competition, you can get your photos noticed by people who wouldn’t normally see your shots. Many people make the mistake of using hashtags that are too popular. Tag a photo with #travel for example and your post will quickly get lost in the abyss of all the hundreds of millions of other posts using that tag. Instead create more specific hashtags and your posts will have a chance at being seen. Start by using hashtags that have only been tagged in a few thousand posts and then work your way up as your followers grow. Personally, I don’t like the look of a caption filled with 30 hashtags. Instead, use the first comment to place the bulk of your hashtags. This keeps your caption looking clean and keeps all those tags tucked away out of view. The top influencers on Instagram use a set schedule when posting. By checking out your insights once you switch over to a business profile, you’ll be able to see the peak times for each day when your followers are online and active. Posting once a day is all that’s needed when you’re posting quality pics with storytelling captions. Personally, if I’m scrolling down my feed and I see 3 posts in a row all within half an hour of each other from a single person, it almost feels like they’re spamming my feed. Use the stories feature for all those times throughout the day when you want to share a snippet of what you’re up to. When I’m traveling I might have 15-20 stories in a day showing off the sights I’m seeing. Post once daily, twice max. Use your analytics from your business profile insights to determine the best time to post each day when your followers are most active. A great free tool for scheduling your posts is called GramTo. What I like about this tool is that, unlike other “scheduling” tools for instagram that just send you a reminder to post, GramTo actually posts to your feed. You set the time you want it to post, upload your photo, set the caption, set the location, and even set the first comment which is great for placing your tags. GramTo also has a ton of automation features and pay features as well including Auto DM for new followers, Auto Like & Unlike, Auto Follow & Unfollow. AUTOMATION! Best Software for Growing Your Instagram Following on Auto Pilot! So after this whole guide showing how to grow instagram organically, why are we now talking about automation? Because there are a few magical programs out there that can act as your own personal instagramming assistant while not breaking any of the rules we’ve laid out in this article. While I only recently started using GramTo for scheduling posts, it looks like it has all kinds of potential for automating so much more. I’d need some more time with it before I can start recommending all those automation features, but it looks like a great place to start for someone new to automation (especially since the majority of its features are free). The one I’ve used for a while is called FollowLiker. This program allows you to enter all the variables you can think of so that it will only like, follow, and comment the content you want it to. For example, I have mine set up to follow certain instagram influencers with massive followings in my niche. It not only goes through and likes and comments those users’ photos, but it also likes, follows, and comments on the FOLLOWERS of those users just like we talked about in this article. In a nutshell, FollowLiker basically automates YOU so it’s like you’re on Instagram 24/7. It’s not free though, and there’s a bit of a learning curve to it. Here’s a pretty solid tutorial video so you can decide if it’s something you want to try. If it looks a bit too complicated, just go with GramTo. Ultimately, Instagram is all about photos and sharing experiences. When you take good photos, tell good stories, and pop up on other active users’ radars who share your interests, you can grow a large following. By following my tips, you can grow your following to 10k+, become an Instagram “influencer”, and turn that traffic and influence into revenue. You’ll have a growing following of REAL people who are ENGAGED, ACTIVE, and love your content. No bots, no fake followers, no problem. How’s that for the Ultimate Guide to Instagram? Did these tips and strategies help you out? Do you have a better understanding for how to get real instagram followers free the right way? Tell me! How many followers do you currently have? What’s your goal? Have you tried automation software before? Any other points or tips you’re looking for that I may have left out? Share your comments and questions in the comments section below! I’m always available, I always respond, and I love hearing your experiences. Thanks for this brilliant insight into IG and growing your followers. A week or two ago I started travelphotocreations and have 155 followers already. Wouldn’t have known how to do it before your teaching. I have a long way to go but am now very hopeful. My only observation, you mention Gramto, but I have read that instagram does not like scheduled post apps such as this and could ban my feed. Please give me your honest feedback. I look forward to seeing more of your travels and I am off to Caribbean for more experiences next week. PS: do you have further lessons ? EG your own IG course. Dave. Very glad to help, Dave! I appreciate the kind words. To answer your question, working with automation is great, but just as you said, you should start slow depending on how long your account has been established. For example, if your IG account is 2 weeks old, I would definitely be doing everything manually. Learn how to follow, like, and comment the larger accounts in your niche and their following directly as I’ve described in my guide with no automation first. Once your account becomes more established, then you can begin to automate, slowly at first, and can avoid any temporary bans from IG. Personally, I think a good rule of thumb would be to stay away from automation until your account is at least 6 months old or has 1000 followers. Then you can dive in slowly. Thanks so much for the comment and questions! I really appreciate it. And yes, I’m very much thinking about creating a full course based on this guide with video tutorials, etc. that would allow me to dive into much more detail with each point. I’ve seen courses like that in the $500 range, but I’d want mine to be much more affordable around the $199 price point with so much content and value that it would be a true help to my followers to build their own following without breaking the bank 🙂 Thanks again! Thank you so much. You’re a Batman of Gramknowledge! I’ve learnt a lot reading this article and your recommendations. I notice that you’ve done a great job creating great “handcrafted” posts (662 up today) but you only follow 196 accounts. Were these number the same when you started or you cleaned up your followers list in some moment according the criteria explained ? Thanks for the kind words. I really appreciate it 🙂 I’m not really a fan of following thousands of accounts. It ends up making your feed not much fun, at least for me anyway. For the longest time I’ve kept my followings down to around 140 or so. These are my actual friends I follow. That being said, I’m currently trying a new follow/unfollow schedule. During the week my followings may fluctuate up to around 300-350, but it should end each week with me back at my 140 or so followings. Trying it out to see how it works for me. Thanks for the comment and question! These are the kinds of comments I love! Very glad to help, brother. I’m always available to you whenever you need me. And if and when you decide to implement your own website to snowball effect with your growing instagram following, let me know. I’m here to help! Awesome, helpful, and informative content Eric. Found your tips very helpful. I have been thinking of ways to get more organic traffic to my website other than SEO. This all makes sense and will be using these techniques to create a following and drive more traffic. You’re the man dude! I’m very grateful for running into your site. You provide great value. I really appreciate that, Fernando! Thanks, brother! I’m a total newbie to IG, so this post comes right in handy. I’m not going to lie, I once imagined how huge my Instagram following would be if I bought followers, but as you said, it’s best to grow your social followers organically. This way, you’ll get more engagement because your followers are actually interested in what you post! I had to learn that the hard way when I first started a business page on Facebook and would invite people to like and follow the page. I got a bunch of likes and follows. And I did get traffic to my site. But my bounce rate had gone up to a whopping 80%! People were only slightly interested in my website. I wasn’t targeting the right audience. This is a great post overall. I will be coming back periodically for more tips! Relevance is the key to engagement. For example, if I share this same post to a group that isn’t so interested in Instagram, the engagement goes out the window. Share your hyper relevant articles to the right people and it takes off on you. That’s why targeting and hyper targeting engaged followers makes all the difference. Glad to help! Thanks for the comment! Wow, what an article. I’m literally motivated to start making changes to my stagnant Instagram right now. I have fewer than 100 followers but a niche that’s alive and well. I’m glad I came across this article and am pumped to incorporate what you just explained. First off, let’s switch from a personal to a business profile. Thanks for sharing this article. Very glad to help! Thanks for chiming in! This is such a brilliant article, thank you. I have a small but steady Instagram following and wasn’t sure how to grow it. Your instructions are really clear and I’ve already started making changes! It was interesting reading about the rule of thirds. Most of my photos are of my kids – how would you apply the rule of thirds to shots of people? For me, I like to think of the rule of thirds as a practice in changing your perspective slightly. Instead of just placing your subject(s) in the middle of the picture (which normally ends up looking blah, right), by just slightly changing your perspective you can come up with a much more interesting picture. Try taking the picture from their eye level, for example, or from below it. Just changing that perspective ends up creating such a better scene. Offset them out from the center and try new things. Changing perspective always leads to better pics 🙂 Thanks for the great question. Nice tip using the first comment for the bulk of the hashtags. Thanks for the article! Absolutely. If I’m going to spend time making a caption a solid one, the last thing I want to do is muddy it up with 30 hashtags at the end of it. I’ve found that using that first comment is a perfect way to keep the bulk of your tags hidden away 🙂 Thanks for the comment! Nice post… Just kidding! I remembered your discussion regarding commenting in Instagram and I guess it is true when commenting on anything, whether a blog post, YouTube video, etc. Why even make the effort if that is all you have to say? This is one amazing article and I have bookmarked it because now I am really geared to try Instagram myself. Now I can simply use your article as a step-by-step guide and have fun with it. I have seen some amazing photos in this post and I am so keen on trying your recommended apps and filters to beautify my photo attempts. I have never used Instagram before and I have this one question I am going to risk asking you (Not sure if I will get crucified by the respective program fans) : What is the difference between Instagram and Pinterest? It is not often that I come across valuable information like this for free. This article covers it all and I am sure anyone reading this will be finally able to grow their Instagram followers to the heights they always wanted. So from the bottom of my heart: Thank you for this post and happy travels. (OK, I might have said ‘happy travels’ with a hint of jealousy because it looks like awesome fun) But I will add ‘save travels’ to my wishes for you. I appreciate the kind words. Thank you so much. The main difference between Instagram and Pinterest is that instagram is mainly about sharing your own photos while Pinterest is more about “pinning” ideas you see online to a virtual bulletin board. They’re similar in their visual aesthetic. I’m happy to share my travels and hope you’ll travel along free as a new follower 🙂 Thanks again for the great comment! This is awesome! I’ve been working on growing my instagram for a while but didn’t fully understand the mechanics behind it, especially how to make money with it. I gotta admit I was totally blind to affiliate marketing. Nice explanation. Very intrigued by this and going to dive deeper! thank you! Really happy you enjoyed this. Understanding how to turn Google into a profitable tool through affiliate marketing instead of just a time waster was a huge step for me. Glad to share this! Thanks for chiming in! Thanks for the great post. I’ve been looking for ways to increase my followers. I have to say I’ve been lacking in the liking, following and commenting areas. I’ve just been posting images for my posts and linking back to my site. I really appreciate your section on Finding the Right Accounts to Like & Follow for Maximum Growth. I never thought to follow the followers, likers and commenters too. I’ll switch to a business profile right away! I had no idea I was using hashtags wrong, thanks for the insight. One last question… I use other social media platforms besides Instagram, do you have a recommended automation tool that supports Twitter, Facebook, LinkedIn and Pinterest as well? Thanks again. This post is a gold mine of useful information. Wow.. This is really nice. since December 2018, I have been struggling to learn how to build instagram followers. Sometimes I do follow other instagram users up-to the point of my following getting to 1k and I’m still having 105 followers. There are some tips which you listed out here on the article such as leaving captivating comments and liking other people pictures.. I haven’t tried this before. I will definitely apply all the steps listed on this article and see if my instagram account will bounce back. Thanks for this great tips. Absolutely. I’m glad you enjoyed this. It’s all about creating a quality environment for your followers. Provide value and interest and your followers will grow 🙂 Thanks for the comment! Thank you so much for the kind words 🙂 I definitely owe everything I know to the training community I call home. Thanks for chiming in! Thank you, BATMAN! I’m loving this and will make sure to put to use all the tips you have provided. I really need to know how to get to targeted audience on IG, cause I do music and I’ll love to gain more followers that’ll influence my musical career. This is exactly what I needed and I’m really liking GramTo! Thank you! That’s what I’m here for! I’m glad you enjoyed this. And yes, GramTo is my go-to for scheduling all my posts for the week. Looking forward to exploring more of what it has to offer. Thanks for the comment! WOW what a fantastic guide to using instagram correctly. I am new to instagram and I must say this post is a huge help for me. My daughter knows IG better than I am lol. Thank you very much for sharing your tips and tricks. This is definitely my go to guide. This is great! Thank you very much for this great post. I’m shocked that you were able to move your followers from 500 to 10k within a short period of time. Had you used follower bots before? You really provide great insights into building your following organically. I’m currently at the 300 mark. Is there any hope for me? There’s nothing that says someone at the 300 mark can’t grow to the 3000 mark, the 10,000 mark, or the 30,000 mark. Instagram growth and growing your followers is a simple process when done right. I’ve never gone after those follower bots because as I mentioned in the article, my purpose to build my following was to be able to have a potential for revenue. There’s no revenue when you’re talking to bots! You really do need real followers and real engagement. Plus, there’s no fun when you’re talking to nobody! lol. My followers are great and have helped me so many times while traveling. Thanks so much for your comment! Have came across a lot of post like this but none of them were nearly as helpful. This is unique and different! The concepts and the step by step process on building your instagram account is top notch! 🙂 Your traveling pictures are exquisite. And also your quote “I’m batman so there’s that” is so humorous. LOL! Nice post all over! Learning from this immediately!